After the STAR 2005 Pieter decided to stop with single handed sailing. The Robosail yacht is for sale. 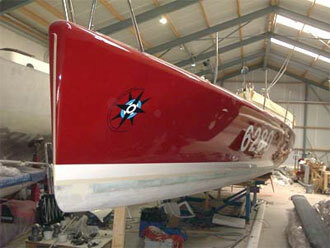 At the moment he is cruising regularly with his classic SWAN 55: the Cesarina. 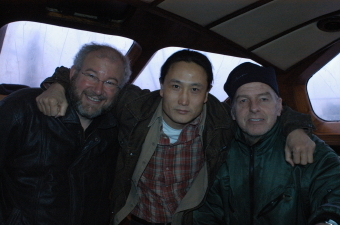 In 2007 he made a trip to Scotland. For 2008 the Azores are on the menu. After a few calm days at sea, Pieter Adriaans and his Open40 RoboSail reached the island of S�o Jorge, Azores. He immediately started off to clean and repair his boat. The mainsail is now fixed, as is the general mess that a race makes of a racing yacht. Pieter, now relaxing on the island, looks back with mixed emotions, but with a mostly positive attitude. "It was great to be back on the Atlantic again", Pieter says. "It's unfortunate it had to end this way, but as I said earlier: case closed. One of the most important things is that RoboSail's innovations worked beautifully, especially the Odys autopilot". It is Pieter's plan to return to The Netherlands in the course of August. The sun shines, I have an 8 knots breeze and whales playing around the boat. I am on my way to my beloved Sao Jorge where Rini waits for me. I was lucky to take some work with me as editor of Elseviers Handbook of Philosophy of Information so I am sitting in the shade editing essays by of some of the best minds on our planet. What more can you get out of life! I have been thinking about what happened the last week and I have come to some conclusions. First of all the race committee should never have bent the rules in order to let Mollymawk make a restart. Consequently they should not have allowed me to make a restart. I am certain the other competitors would have taken the opportunity to make a restart, had they known about this new interpretation of the concept of outside assistance (I actually phoned Michel Kleinjans and left a voice mail stating as much, because I thought it would be unfair to deny him this opportunity.) Maybe I should not have been so eager to make a restart under this debatable interpretation of the rules. Furthermore, after allowing a restart, the committee should not have reversed this decision half way the race. I bet they have been hoping that I would retire out of my own account and really got worried when this did not happen even after I damaged my mainsail. Finally, they should not have acted like I was not restarted at all, when they decided to kick me out of the race. That last one was really malicious. Amongst other things it implied that I had been sailing uninsured without knowing it. The legal consequences of this action could have been enormous. All this characterizes the race committee for what they are: a bunch of amateurs. But then again, we are all amateurs and we should be glad that there are still amateurs around that are willing to organize races like this. The sailing sport is too dear to me to let it be spoilt by an incident like this, so I decided to forgive them. As far as I am concerned the case is closed. Let's turn to the future. In August I will be back in Plymouth. I invite the committee to drink a pint we me and to discuss the matter. Let's see to it that thing like this happen never again! A few days after the start of the OSTAR one of the tubes of my hydraulics system of the boomvang chafed through. It was impossible to make repairs at sea and it was impossible to sail on, so I had to go back. I needed a new tube so I knew I was out of the race. P: How can Mollymawk make a restart with a new dagger board. That is certainly outside assistance? C: He can have a new daggerboard but he has to fit it himself. P: So that means that you can buy spareparts and still make make restart as long as you do the repairs yourself. P: I am on the verge of breaking that rule. Carl here is going to help me with the repair of the radar. So if I do the repairs myself and leave Carl on the jetty I can make a restart? The idea to make a restart was born at that moment. There are two people more than willing to testify that this was what took place. C: He is starting again. C: Oh he is alright. He did do al the repairs himself. A couple of hours later I went to the race office and I announced that I was making a restart. I shook hands with all the officials, was congratulated on my perserverance and took off. The next day the RWYC announced that I was restarted at the website. In short: there can not have been a shadow of a doubt about my intentions, and there cannot be a shadow of a doubt that the RWYC in it's communications towards me systematically has lead me to believe that a restart was possible. "Not sure whether it was made clear after you retired to Plymouth and you left a second time that your present voyage would not be the RWYC's (Organising Authority) responsibility or count for a official finishing time. Very happy to monitor your progress which is totally your responsibility. Hope to see you in Newport or at the Reunion/Prizegiving in October. - Rules describing what is outside assistance should be perfectly clear and explicit..
- Rules should not be changed half way the race..
- When people are allowed to restart this decision should not be reversed when people are already half way the Atlantic Ocean. - When the organisation decides to force a competitor to retire this decision should be communicated to the competitor. - The decision should not be made public via a website before it is commicated to the competitor. When I look at these rules they seem pretty obvious, but any one of them has been violated in this matter. I think what has happened is by any standard, human, ethical and perhaps even legal, completely unacceptable. At this moment I am on my way to the Azores. Let it be very clear that the decision to go there was motivated by the step of the committee to remove me from the race. I have not given up the race. I have damage to my mainsail, but this would not have prevented me from reaching Newport. 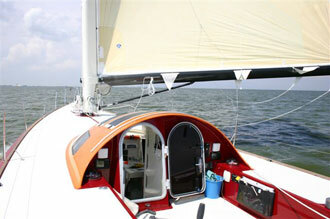 I can stil make about 4 to 5 knots of progress in light weather and about 7 to 8 in normal conditions. For a number of reasons (one of them is insurance ) I do not wish to continue to go to Newport outside the race. In a move that seems just as unorthodox as their earlier ruling, it seems the Royal Western Yacht Club of Plymouth (RWYC) has now decided to retire Pieter from the OSTAR! By doing this, they have seemingly reversed their earlier decision that gave Pieter the opportunity to continue the OSTAR after single-handedly repairing the damage to the RoboSail Open40. The reasons for this RWYC-ruling are not known and, at this moment, it seems that no one can clarify things. Pieter himself, who received the news earlier today by Iridium phone, is now mentally somewhere between surprise and fury. He has changed course and is now heading towards the Azores. We will continue to inform you as more information becomes available. Despite the damage to his Open40 RoboSail, skipper Pieter Adriaans remains in good spirits, he told his team through his Iridium satellite phone today. Though the list of repairs-to-do keeps on growing, Pieter is confident he will be able to finish the race as intended. "I don't think I'll break any records though", he said. The skipper himself is in good spirits: he eats well, sleeps well and keeps a steady schedule. Talking to his friends and loved ones through his satellite phone is important to him, he adds. "They make me feel less alone, whenever I'm frustrated by another dirty job to do - alone", he says. But: "despite everything, I feel at home. At home at sea". See 'Race Coverage' for regular updates on Pieters position and status! 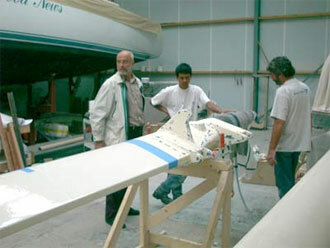 Pieter Adriaans and his Open40 "RoboSail" have continued their 2005 participation in the famous OSTAR! In a rather surprising and quite liberal decision, the RWYC have ruled that OSTAR-participants who repair and manage their ships single-handledly, are allowed to continue their race. So, after having repaired the boomvang and other damaged parts, Pieter hoisted the mainsail again and continued on to Newport, RI. He just reported light winds but is delighted to make some headway. We'll keep you up to date on his progress on this site, and under 'race coverage'. Just when you thought it was all over: stay tuned! At this moment we are in Plymouth working on repairs. We will decide on new plans for this season by the end of this week. Lot's of people said farewell to Pieter and his boat in SeaPort Marina on saturday. In the coming days Pieter will sail the boat to Plymouth with his brother Carel. In third the week of May Robosail will set sails for Plymouth. 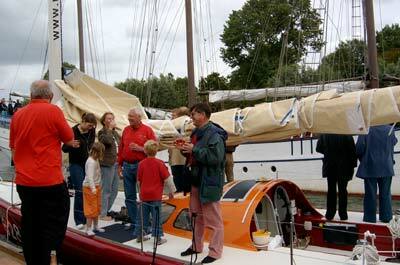 For those who want to see the boat and wish the skipper good luck there is an 'OPEN DAG' on Saturday May 14. 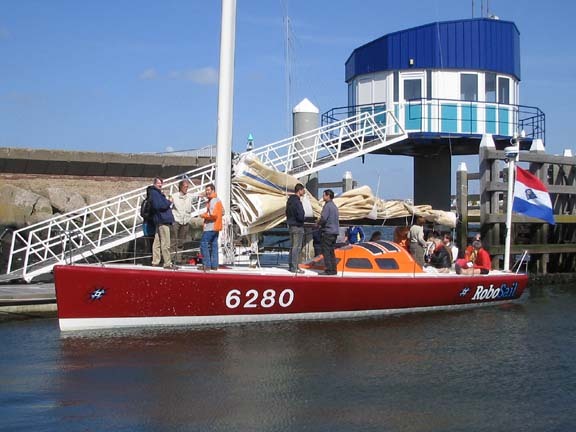 The boat will be berthed at the fuel jetty at the far corner of SeaPort Marina IJmuiden. You can visit the boat and talk to the skipper. The event starts at 15.00h. Zhai Mo, the 36-year-old Chinese painter form Shandong will be the first Chinese to attempt a solo voyage around the world. This week he was in Holland as a guest of Robosail when he met Pieter Adriaans and Henk de Velde. Henk will act as a special advisor for this trip. Zhai Mo is looking for a boat and additional support in Europe. His route will start from Qingdao, passing the coastal cities of Shanghai, Wenzhou, Ningbo, Fuzhou, Xiamen, Taipei, Shenzhen, and Hong Kong, covering a total distance of 18,000 kilometres and taking about one month. He will then continue on to the Indian Ocean through the Strait of Malacca. He will also cross the Atlantic Ocean after sailing through Suez Canal and Mediterranean Sea. Zhai will call on some small islands in the Caribbean Sea on the way. His route then passes through the Panama Canal in Central America. After visiting the Maya civilization he plans to head into the southern hemisphere, before travelling back to China, with a stop in the Philippines. The total distance to be covered amounts to 28,000 nautical miles, touching upon 30 countries and over 50 ports. The journey will take 12 months. Pieter is looking back on a successful season with Robosail. He sailed the yacht from IJmuiden to the Azores and back in August and September. 'Our ambition in this season was threefold,' Pieter says, 'To finish the refit, to test the boat and to qualify for the OSTAR next year. We have realized all three goals. The new swing rig has proved to be seaworthy and extremely easy to handle. The only problem is that sailing a swing rig is a bit dull. You miss the stress of changing headsails all the time.' Pieter believes that the best preparation for a race like the OSTAR is to make long single-handed cruises. 'It is a pity we missed the Petitbateau Race, but in the end we did much more ocean training then we could have done in this race.' The next big issue is performance optimization. In the coming weeks we will work on an extensive test program to decide what we want to change in the mast and the sail this winter. The RoboSail Open40 arrived in the port of Velas, Sao Jorge, Azores, after a difficult journey across the Atlantic Ocean. Skipper Pieter Adriaans reports: "It was a difficult trip, with some exceptionally heavy weather in the Bay of Biscay. Nevertheless, no irrepairable damage was done, so after a week of rest and repairs, I'm preparing myself and the ship for the voyage home". Indeed, it promises to be a good downwind stretch; ideal for this type of ship and rig. "I'm really looking forward to see what this radical rig-design can do in the circumstances it was created for", Adriaans says. On monday the 23rd of august, Pieter left Falmouth with RoboSail to sail single-handedly to the Azores. This trip is both a qualifer for next year's OSTAR, as well as an extended training exercise. Last thing we heard through the Iridium connection was that all systems are functioning properly and the skipper feels relaxed and at home at sea. Currently Robosail is in Falmouth. Pieter sailed the boat from IJmuiden to Fallmouth singlehandedly last week. On the 20th of August he will leave for his qualification trip. We will keep you informed about his progress. 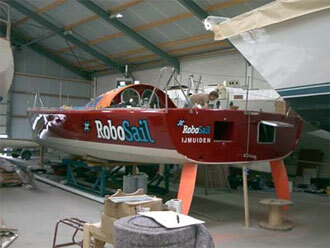 In the beginning of July Robosail made her first trial runs at the IJsselmeer off Medemblik. The combination of the Vels mast and North sails worked very well. Unfortunately we had a lot of problems with the hydraulic system of the boom. It snapped off several times. Van de Stadt has redesigned the construction and we hope to have the boat ready this week. This means that we could not make it to the start of the Petitbateau race. When the boat is up and running we will tell you about the new plans for this season. The new deck and cockpit layout. Almost no lines and no winches. The boat is about 400 kg lighter. (This is 10% !). Downwind she sails like a big Finn. 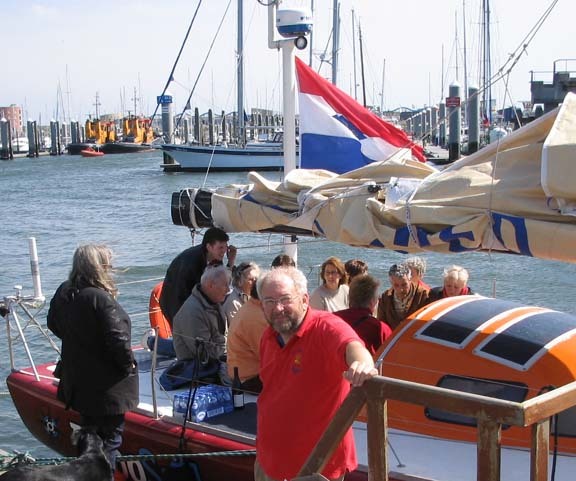 On the fourth of July Robosail was baptized by Ingrid and Johan Adriaans in the old Dutch harbour of Medemblik. Many of of our friends family and relations took the opportunity to have a look at the boat with her new red colour and the Robosail logo. At the beginning of July you might spot the Robosail at sea off IJmuiden doing her first sea trials after an extensive refit. The Robosail (ex-Syllogic) lost her canting mast during the last Route du Rhum in the Bay of Biscay. Anyone who expected that skipper Pieter Adriaans would go for a more traditional approach after this accident is in for a treat. 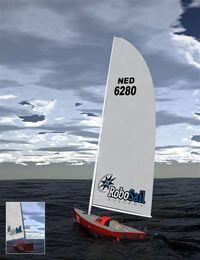 The Robosail will have a revolutionary new swing mast developed by Vels and van de Stadt Design. The boat will be cat rigged with one mainsail of 108 m2. The mast is an unstayed wing mast that can rotate 360 degrees. 'Our calculations show that the boat will be as fast as under the previous rig, but much lighter and much easier to handle. I cannot wait to do the first tests.' sais Pieter. Of course the Robosail will be sailing with the most recent version of the Odys self learning autopilot. In the four years after in the 2000 Europe 1, Newman STAR the system has grown from a scientific prototype to a mature, robust and versatile product. Pieter: 'At Robosail we do a lot of consultancy for race yachts with our datamining software. It is amazing how fast you can calibrate your sensors and optimise the performance of the boat'. He sees the 2004 racing season as a test for the new rig and as an opportunity to qualify for the STAR 2005. At the moment the team of builder Johan Vels is working very hard to get the yacht ready for the Petitbateau Race that will start on July the 17th from Falmouth in the UK. The Hiswa Amsterdam boatshow at the RAI is in full swing, and RoboSail is right in the middle of it. Located next to classic 56' racing yacht "Zwerver", our stand is open to everyone wishing to inquire about our high-tech products, as well as about the Sailing Team and her new Open40. We can be found in Hall 7, at stand 200, with our dealer Cornelis Jongkind Scheepselectronica. A look at the picture next to this article will give you an impression of what we have to offer. This saturday, the 21st,Pieter Adriaans will be at our standsigning his latest book, 'Robot op Zee'. At 15.30u, he will give a talk about all his plans with the Open40 at the Delta Lloyd SailExperience stand, which can be found in Hall 2. Please note: contrary to earlier reports of 16.30u, the talk will be at 15.30u! Furthermore, more plans about the new Open40, formerly known as "Syllogic", have been made public. As the wharf is busy reconstructing the hull, Pieter Adriaans and his team are already preparing the "look" of things. The rendered image shows a first peek of things to come. At his Hiswa-talk, Pieter will probably reveal some details about his artistic aspirations for the mainsail. We hope to welcome you at our Hiswa-stand, somewhere in the coming days.